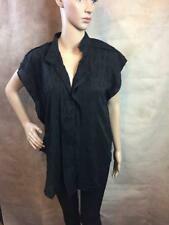 Zara Black Blouse Frill Cap Sleeve Great Condition Size M. Longer at back Condition is Used. Dispatched with Royal Mail 2nd Class. Cross wrap front tunic. chest - 18" armpit-armpit. Condition is used but in fantastic condition, great quality & plenty of wear left in it. Lovely material & pocket detailing. ZARA BNWT Crop Knit Top Cotton Navy Blue White Stripes Sz S Best Fit XS 6. Dispatched with Royal Mail 2nd Class. Gorgeous Zara Ivory V-Neck Top in a Green and Pink Ditsy Floral Print lightweight Fabric with Front Bow and Cap Sleeves, Labelled M, UK Size 8-10. Length 23". Ladies Blouse, Zara Size XS. 7 button front fastening to neck and tie, side splits. Zara pink floral floaty top with lovely cap sleeves and tie waistband Condition is Used, but only worn a couple of times Dispatched with Royal Mail 2nd Class. PIT TO PIT: 19" SHOULDER TO SCOOP HEM: 25" CLASSIC ZARA QUALITY TOP PERFECT FOR SUMMER! Zara Ladies Blouse Size 12, Beautiful Design, Brand New Without Tags. What we have here is a beautiful brand new without tags Spotty Blouse from Zara in a size 12. It has only been tried on. Postage will be charged Please check out my other items. I am more than happy to answer any questions asked I am more than happy to combine postage just ask. New items added daily. Shirred bib chest. swing loose fit. crochet lace side details. colour: dusty blue. A gorgeous cotton blend blouse in excellent condition. Zara Basic White Black Polka Dots Spots Pattern Red Button & Bow Detail Waist Length Casual Blouse Top. For sale a lovely quality waist length casual blouse top from Zara Basic. Zara basic logo on textile label back of the neckline. RRP £25.99. Zara label inside. Care label in side seam. In an ivory sheer cotton fabric with embroidered textured line pattern. Cap sleeves with frill effect. Lovely comfy long top from quality brand ZARA. The top is loose fitting in floral print, with Button neckline , short sleeves and it is 100% cotton. Slightly sheer. It is a size small with underarm to underarm measurement of 21” and it is in great condition, please see the photographs. It comes from a smoke free home. Zara basic. Blouse top. Floaty cap sleeve. approx length from shoulder to hem. Material: polyester. A lovely t shirt from Zara in a size S (approx UK 8). - navy blue background. Relaxed fit and side slits make for a perfect beach cover up. - high side slits. - white vertical stripes. Zara Black Blouse With Frill Edging Size S. Condition is Used. Dispatched with Royal Mail 2nd Class. Any questions please ask. From pet and smoke free house. Zara top in a multicoloured boho lightweight fabric. Floral patterning across the fabric. Seep v neck and cut out detail to the bust. from shoulder to hemline 26" approx. Loose fit irregularly pleated blouse with wide sleeves. Size M, fits a Uk 10-12. A Satin Feel Blouse with Tie Wrap and Buckle Piece Attached. Excellent Condition. (Lo ve ly fitted Zaras hi rt ! I’m UK size 10 and fitsm e fine: ). See through at the back, but lined at the front. Short sleeve top with a stand-up collar. Composition – 100% Viscose. Zara Trafaluc Collection Bird and Flower Cream Blouse Size L. Dispatched with Royal Mail 2nd Class. ZARA LACE OVERSIZED TOP. All our products are 100% original Zara. For sure you will have a GREAT experience. WHITE LINING UNDERNIGHT. ZARA WHITE BEADE COLLAR BUTTON BACK SHORT SLEEVE BLOUSE SIZE UK XS EUR 6. Worn once. Excellent condition. Smoke free pet free household. Dispatched with Royal Mail 1st Class. Zara yellow cream ivory lace blouse top hippie hippy boho. Ivory lace trim. Contrast Embroidered floral design. Soft fine cotton. ZARA Trafaluc Collection chic blue flower print blouse with small cute butterfly ruffle cap sleeves and stylish black suede bow back closure. Casual wear, fit for elegant evening / special occasions, weddings, prom or festivals. Zara Print Blouse Size XS. Condition is Used. Dispatched with Royal Mail 2nd Class. Too small. Having a clear out, can combine shipping. Please take a look at my other items. Items only worn once or not at all. UK buyers only. Any questions please ask. Cute little blouse with slim ties at neckline. Zara Floaty Camisole Top Patterned Floral Print Blue . Condition is Used. Dispatched with Royal Mail 1st Class. Zara black lace polo style blouse with collar and deep v and buttons. Size XL but would say a 14. Sheer with buttons on cap sleeves and cotton collar. Picture says it all. Really nice and stylish blouse with black skirt, trousers or jeans. Can obviously be worn with black camisole underneath.